Do you dream of a straighter smile? If so, you won’t want to miss two upcoming events where Winning Smiles will present your orthodontic options and give you an exciting, interactive look at Invisalign, the alternative to metal braces that’s perfect for busy teens and families! 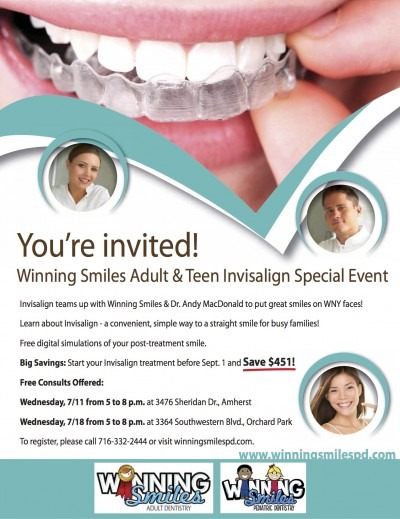 The Winning Smiles Adult & Teen Invisalign Special Event will be held from 5 to 8 p.m. on Wednesday, July 11that the Amherst office, located at 3476 Sheridan Dr., and from 5 to 8 p.m. on Wednesday, July 18that the Orchard Park office, located at 3364 Southwestern Blvd. There, guests will get to tour the office and meet our dental and orthodontic teams, which include Dr. Andy MacDonald. Dr. Andy is our new orthodontic specialist, who brings with him a sterling reputation and 27 years in private practice. You’ll find out if Invisalign is right for you, and also learn about your financial options. You won’t have to settle for imagining what your new, straight smile might look like: you’ll actually be able to see a simulation of your teeth moving from crooked to straight within five minutes of being digitally scanned! You’ll be able to compare the before and after photos, and share the images with family and friends. Best of all, Winning Smiles will offer a $451 savings to those who begin treatment before September 1, 2018.